Gree air conditioner systems are among the newest and best ductless systems money can buy. Gree air conditioner manufacturing is the largest mini split ductless AC company in the world. If you are thinking of buying a Mitsubishi Mr Slim ductless air conditioner. think again with a Gree air conditioner ductless system. Gree ductless air conditioners are available in a wide variety of mini split sizes and styles to fit any scenario in your office, home, recording studio or church. Ductless mini splits by GREE offer small an large air conditioner systems for any room size. Gree mini splits come in a variety of styles including Gree Admiral series, Gree heat pump Inverter series, Gree Artful models, Gree Trendy ac systems and Gree knight mini splits. Gree ductless packages are also available for commercial HVAC applications. Gree air conditioner ductless model NEO is also available.Gree NEO is a compact yet energy-efficient and powerful ductless ac system. The Gree NEO model is a high-energy ductless AC split system that is very advanced and goes far in providing cooling energy and power in just a single zone mini split applications. Don’t be fooled by the GREE NEO’s compact mini split design. Despite the Gree NEO’s extended cooling power, the NEO has a clean, contemporary look that’s very attractive and sleekly designed to fit perfectly into any home or business interior. 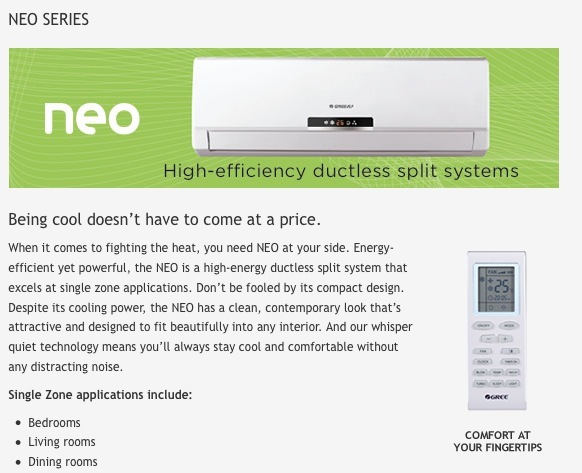 The NEO is also whisper quiet using advanced ductless technology so you can stay cool and comfortable without any all the distracting noise of other window and wall air conditioners. Sleep function enables home owners to design their own custom cycle that will follow their sleeping patterns. This will help to maximize the greatest comfort conditions and also reduce cost of utility bills and energy consumption. Gree also has Intelligent Defrost technology which reduces energy loss a great deal and also reduces defrost time by only allowing units to defrost when it is needed as opposed to when it is set by the timer. Gree Gold Fin condenser protects against the corrosive effects of outside air, extending the operating life of your system.